I have created a new line vector layer and have attempted to add a linear feature. I finish editing, and the feature is depicted on the map. However, it does not show up in the attribute table. I WAS EDITING THE CORRECT LAYER. The new feature is depicted with the green "X" at the end of the feature. If I click on deselect all, the X remains. To add insult to injury, when I remove the offending layer from my TOC, THE MISBEHAVING FEATURE DOES NOT DISAPPEAR. What in the literal heck? I made the mistake of saving the map document with the erroneous feature, so now it's apparently never going away. I'm thinking that maybe my .qgs is corrupted. 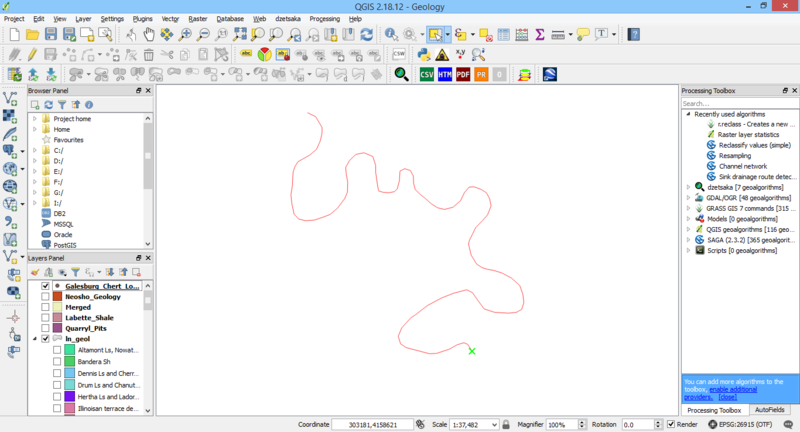 Browse other questions tagged editing qgis-2.18 vector-layer or ask your own question. Removing green Xs and red lines in QGIS? Assigning colour to QGIS vector layer fields? How can I turn editable a shapefile that has been previously saved filtered?